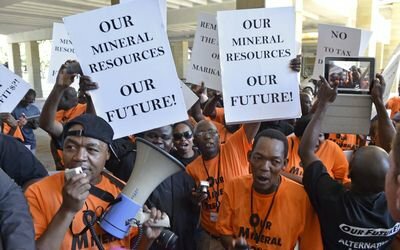 Protestors outside the 2013 Mining Indaba, Cape Town. Business Day/Trevor Samson. There is no shortage of grassroots political action in South Africa today. With a new post-apartheid generation coming of age, protestors mobilize against all types of social inequality and injustice. One legacy of the anti-apartheid era is a tendency to not be shy about demonstrations or organizations. How much this fact translates into effective, widespread civil resistance, or whether such resistance will be mobilized against encroaching militarism and other political and social problems, is another matter altogether. In the small one-room apartment that serves as SoS’s meeting place and studio, Anele and his crew pondered the role of the South African National Defence Force (SANDF) “when the army is supporting the state, and state intelligence has worked to infiltrate NGOs and peoples movements.” The disconnect between South Africa’s youth activists and the elder freedom fighters-turned-corporate and government officials is a major roadblock to social change. In the award-winning film Dear Mandela, publicized as the story of the first post-apartheid generation, student leader Mazwi Nzimande reflects that he never thought he’d become an activist because he never thought he’d be “fighting for something we were promised.” He likens his sadness at living for more than two decades in a barely adequate shack (which is subject to arbitrary destruction from teargas-and rubber bullet-wielding local police) to Mandela’s twenty-seven years behind bars because some of “what he had been jailed for has never been achieved.” The residue of uneven social policy remains. Of course the generational and political disconnect in post-apartheid South Africa is itself uneven; there are those whose work in the United Democratic Front (UDF) and other structures of the 1980s was rooted in practical, people-centered, nonviolent strategies not easily sold out or traded in. In a recent reflection at the 2013 School of Authentic Journalism in Mexico, Mkhuseli Jack - a key coordinator of the 1985 consumer boycott in Port Elizabeth - spoke about the strategic organizing which characterized the massive social movements just before the end of apartheid. “We knew [social change] would take time and careful planning: there is no short-cut to that.” Boycotts and other unarmed resistance tactics take the building of networks, careful mobilizing of communities, and popular education. “We developed a clear set of guidelines - developing strategies was a huge part of the process,” noted Jack. Another important UDF figure, Sandile Thusi, was among the many young people detained without charge in the late 1980s as the racist regime was beginning to weaken. In a campaign that many analyze as “the straw which broke the camel’s back,” Thusi helped lead hundreds of detainees in a nation-wide hunger strike which re-energized the broader movement through the last months before negotiations began. After the 1994 democratic elections, Thusi went on to use his skills to build a huge communications infrastructure in Durban (as fellow UDFer Ivan Toms built far-reaching medical units throughout Cape Town in the same period). Mkhuseli Jack is one who now believes that the lessons and strategic sensibilities of this era must be re-taught and re-emphasized if a new movement is to emerge able to effect policy changes. Organizing of a different type was evident at an August 2012 Durban-based conference on “Nonviolence in Action: From the Roots to the Fruits.” A multi-generational gathering of students and elders of the Indian community, along with an international grouping of non-Indian nonviolent activists and admirers of Gandhi, this conference - convened by Mohandas’ grand-daughter and Gandhi Development Trust founder Ela Gandhi - nevertheless contained precious little discussion about the creeping militarism on the continent widely discussed elsewhere. Nathan’s pronouncement is true enough - for now. Stark economic pressures in the poorest sectors of South African society, especially amongst the youth, contrast greatly with the relatively luxurious lifestyles affordable to many older, anti-apartheid era “movement veterans.” This fiscal gap is paralleled in a political gap regarding who, how, and what to fight. The post-apartheid generation, using basic tactics from the nonviolent toolbox, has focused on calling out those they perceive as governmental sell-outs and compromisers, looking to gain meaningful reforms or a change in the basic power paradigm. The anti-apartheid era activists, more likely to be concerned about the militarism they can’t help but notice in a society they helped steer towards peaceful democracy, are less clear about what issues or targets to coalesce around - and therefore have been less successful at generating new movements, barely even attempting to hold demonstrations or vigils. As the Zuma regime intensifies its militaristic policies abroad and at home, and as South Africa gears up towards a new season of national elections during the twentieth anniversary of the end of apartheid (and the election of Nelson Mandela), that gap may well diminish. The coming year is likely to be one of great protests amidst the politicking.